Slovenia is a Central European nation. Kupa (Croatian) or Kolpa (Slovene) River provides a natural boundary between Croatia and Slovenia. Slovenia is a mountainous central European country that spans about 7,827 square miles. The capital city is Ljubljana. Slovenia and the country has a total population of approximately 2 million people, most of whom are Slovene which is also the official language of the country. Slovenia has been part of some of history's greatest empires which included the Byzantine and Roman empires. Napoleon and the Habsburg Monarchy also conquered Slovenia. Germany and its allies, Hungary and Italy, occupied Slovenia during the Second World War and after their defeat, Slovenia was one of the founders of the Federal People's Republic of Yugoslavia which later became a communist state. It had the distinction of being the only nation within the Eastern Bloc to have never signed the Warsaw Pact. Slovenia became an independent state in 1991 and the following year it was admitted to the United Nations. Slovenia joined NATO and the European Union in 2004. The borders of Slovenia have been fluid for most of history, and after its independence, it bordered four countries: Italy, Croatia, Hungary, and Austria. To the southwest, the state is bound by the Adriatic Sea. The country's culture has been significantly influenced by the states that had previously conquered it as well as Lutheran and Catholic doctrine. The border between Italy and Slovenia is approximately 123.7 miles long and was defined after Slovenia became an independent state. The two countries have embassies in each other's capital and at least one consulate each. The relationship between the two nations dates back to the First World War when Italy was given control of part of Slovenia's territory as a reward for siding with the Allied Powers. The rise of fascism in Italy caused extreme suffering for the more than 300,000 Slovenes in Italy most of whom chose to emigrate. During the Second World War, Italy took control of the southern part of the country including the capital Ljubljana. The Italians were expelled in 1945 by the anti-Nazi resistance which later established a communist country. At the moment, the relationship between the two countries is cordial with more than 400,000 Italians touring Slovenia annually. Austria and Slovenia share a border that is about 205 miles long that was settled on after the independence of Slovenia. Austria and Slovenia have a shared history that goes back to the time when the territory of Slovenia was part of both the Austrian Empire and the Austro-Hungarian Empire. In 1918, Austria and Slovenia had a territorial dispute that led to fighting for about six months. The conflict had to be solved by a referendum that resulted in the Prekmurje region being given to the Slovenes while Austria got the area of southern Carinthia. Austria is currently a major ally of Slovenia as they share strong economic and diplomatic ties, with Austria having its embassy in Ljubljana. In spite of their close ties, Austria is constructing a fence that is approximately 2.3 miles long near Spielfeld to control the flow of migrants into the country. The fence was constructed in response to the European migrant crisis. Slovenia's longest border is shared with Croatia and it is about 282.7 miles long. Before Slovenia gained independence, both countries were part of Yugoslavia. The two countries maintained positive relations established during that time with each nation having an embassy in the other. The relationship between the two-state is strained by various issues that mainly involve the border. The countries had disputed how to rightly divide the territorial waters that belonged to the former state of Yugoslavia, the Gulf of Piran in particular. The effects of the dispute were particularly severe for fishers. The dispute required the intervention of foreign arbitrators, a referendum, and a decision by the Slovenian constitutional court before it could be settled. The poll was held in Slovenia, and 51.54% of the people who voted supported the decision. The Slovenian army has barracks in a location of the Žumberak Mountains partially claimed by the Croatians. 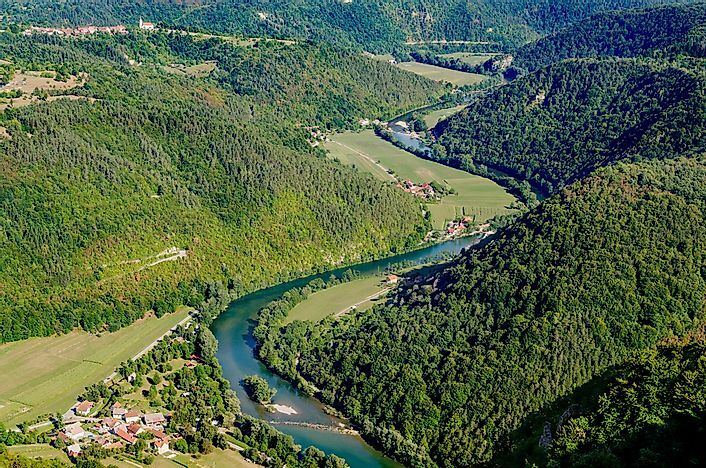 The two countries also have issues with the border at the Dragonja River which the Croatians believe to be the border between the two countries while the Slovenians believe that the border is south of the river. The Ljubljana Bank has also been an issue between the two countries and a Croatian bank has filed a lawsuit against the Slovenian bank. Slovenia was once part of the Austro-Hungarian Empire and now shares a border approximately 63.38 miles long with Hungary. While Slovenia was part of Yugoslavia, it acquired the region of Prekmurje which previously belonged to Hungary by signing the Treaty of Trianon. The two countries have cordial relationships with cooperation in a wide array of fields including tackling organized crimes and environmental issues. Diplomatic ties between the two countries are close as they maintain fully staffed embassies in each other's capitals. What Do The Colors And Symbols Of The Flag Of Slovenia Mean?